The flyer in braille for ANWB AutoMaatje is developed to make the transport service accessible to people with a visual impairment. The CBB produced this flyer. Oktober last year, the first copies were handed out by alderman Hans de Haan. Braille on aluminum. It is one of the many possibilities with braille. It is a much used technique for placing signs for the blind. Business cards with braille. It is one of the smallest products we produce. Yet for us, business cards with braille are a big product. 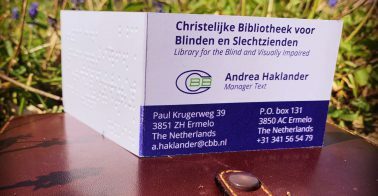 With a business card with braille, you give the signal that the blind and visually impaired matter to you. Sometimes, integration can be reached with the simple things in live. Things you might not think of initially. Like a photo calendar that contains braille. 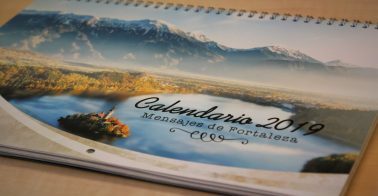 The CBB produced a calendar that can be used by visual impaired and seeing for Costa Rica. The puppetry museum in Vorchten is doing all to make its collection accessible for people with a visual impairment. This deserves appreciation. January 4 is the world braille day. The CBB nominates the puppetry museum for a ‘braillepluim’. Braille is a very important tool for blind people to have independent access to information and reading. Designed to overcome barriers. However, braille also creates barriers. Reading a braille book together with a blind child, for example, is difficult if you can't read braille. Braille is often associated with paper, bulky braille books full of dots. Yet so much more is possible. 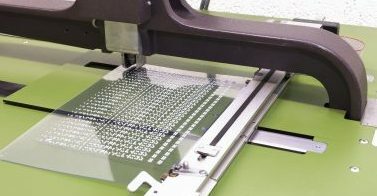 In fact, braille is increasingly being used for other applications. With pride we present: www.braille.nl. 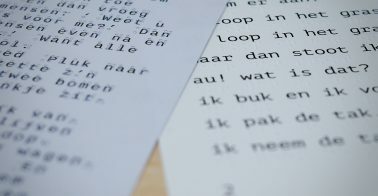 Braille.nl is the new website from the CBB and intended to tell you - and others - about the possibilities of braille. 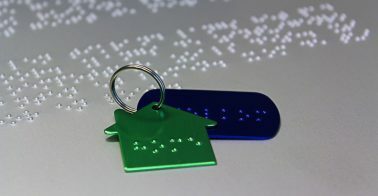 Our website braille.nl has hopefully given you a better idea of all the possibilities in the field of braille. But you might wonder who is the organisation behind braille.nl. Who is the CBB?